Map Samples - 2017 Maps of the Month - Maps & Facts Unlimited, Inc.
GIS mapping facilitates combining multiple layers of discrete data. 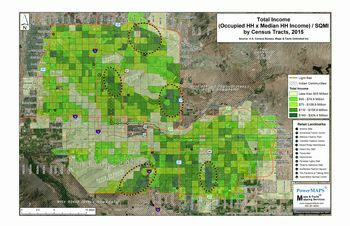 This month, we have combined the number of households by median household income divided by the number of square miles and color-coded total household income by census tract; after adjusting for population density. As seen, there are at least five �clusters� which represent the highest total incomes. Sometimes this may be a proxy for other data points such as disposable income, housing prices, and schools. S. Scottsdale near Scottsdale Fashion Sq. 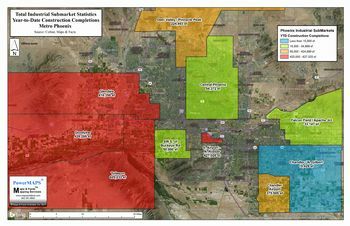 Maps & Facts researched the 2016 AzMERIT scores for the Top Metro Phoenix Elementary and High Schools. Eight (8) top Elementary Schools were paired with five (5) top High Schools. 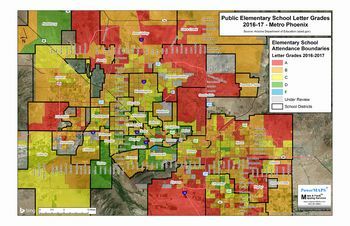 We then calculated the Median Sales Price for each Elementary School�s attendance boundaries. The median is the midpoint of all sales (not the average). By definition, half the median sales are below the median price and half are above. The attached chart summarizes our data. Because 2016 median was about $240,000, we have also included the high and low prices for each school. 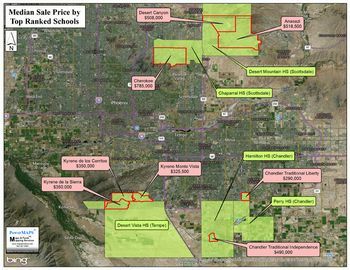 As shown, affordable price houses are available in most of these elementary school districts. The Phoenix Business Journal has a more detailed look at the individual schools - Click Here! 2016 Single Family Appreciation Update: +4.25%. Most year-over-year appreciation surveys can vary dramatically from year-to-year because the data often includes a wide mix of all houses, of all ages, of all sizes, of all prices, for all extremes (including outliers) � hardly apples with apples. Maps & Facts Unlimited tracks the price pattern of a representative house; not the entire mix. For each year since 2001 Maps & Facts Unlimited has tracked sales of single-family houses built between 1990 and 1999 which sold between $100,000 and $1,000,000. I.e. How has the median appreciation rate for our representative house changed since 2001; and more importantly today, since 2015? The chart below tracks 15 years of price changes. Based on over 15,000 sales, the median sale price in 2016 was $270,000; 4.25% higher than 2015. 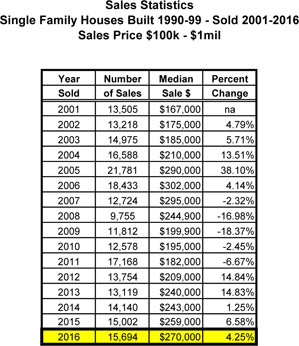 The chart also shows that the median sales price is still well below the $302,000 peak in 2006. On the following 2016 map, the red dots represent the locations of the 2016 sales. When we compare each year�s dots*, their locations are virtually identical. Maps & Facts has been tracking the median price changes of our representative �benchmark� house; i.e. built 1990 to 1999, $100,000 to $1 million, since 2001. (See March 2017 map). As our March 2017 map shows from 2015 to 2016 our benchmark increased from $259,000 to $270,000; an increase of 4.25% � still not back to our 2006 high of $302,000. To see where we may be going, as shown, this month we mapped all benchmark MLS house listings by MLS grid. As of April 19, the median list price was $409,900. While this number is a giant leap from 2016�s $270,000 median price, and not to be relied upon, it is due to major differences between our recorded sales data base and the MLS�s data base. The MLS data base includes a widely different mix of listing prices and Days on Market than does the recorded sales data base. For example, of the 2,440 MLS listings, 1,037 (42.5%) are listed above $450,000, and, have been on the market 100 days or longer. A better guide is to examine each grid and compare current medians with past sales in that grid. Together, it is probable that prices for our benchmark houses will increase significantly this year! Any way you cut it, Phoenix is back! On Sunday, June 11 the Arizona Republic published �Can Phoenix ever escape its suburb label?� This excellent article focused on Phoenix as the fifth largest �city� in the US with 1,615,017 residents. The article conveys the common perception that big cities have skyscrapers, trains, and density but also queries if �big equals urban�. While Phoenix is a big city, will it ever be a Philadelphia, Seattle, or San Francisco? 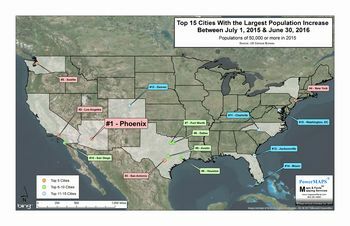 To add some additional perspective, this month�s map suggests that Phoenix will never be a �Big� city. 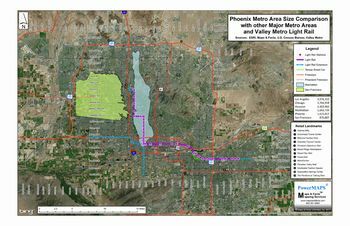 As shown, both San Francisco and Manhattan easily fit within the city limits of Phoenix. Manhattan has 1,643,734 people squeezed in 34 mi.�. Phoenix has 1,615,017 people spread over 516 mi.�. 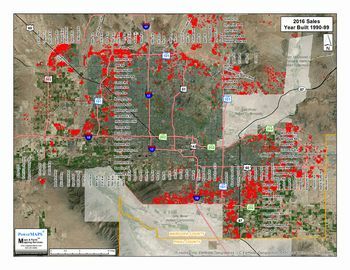 Add the Metro Phoenix land area and population and the idea of Phoenix as a �Big City� is even more absurd. Since we now have a fully functioning �vacation� home office in Flagstaff, we are interested in exploring submarkets, prices, and trends. The Northern Arizona MLS identifies �Regions� which include discrete submarkets within each. Obviously, each region and each submarket is different. However, the big picture is a starting point. This month we mapped the Regions which include Flagstaff and researched all single-family sales since January 1, 2016 between $100,000 and $1 million. The results are color-coded on this month�s map. Of interest, there were sufficient sales in each region (1,360 total) for a meaningful median. Ready to buy your vacation home yet? As the Metro Phoenix real estate economy continues to strengthen, the newly completed warehouse market is leading the parade. As this month�s map shows, in just the last six (6) months the Westside industrial markets have added over 3,000,000 ft.� of completed buildings: i.e. C of O�s issued. The S. Airport to N. Roeser Submarket was no shrinking violet either! 10 years ago (August, 2017), The Phoenix Chapter of the Urban Land Institute (ULI) identified the 10 Hot Intersections. (Map of the Month � April 2008). Last week, ULI updated the 10 Hottest as shown on this month�s map. Certainly there are more, but this year�s selections clearly recognize �infill� locations. 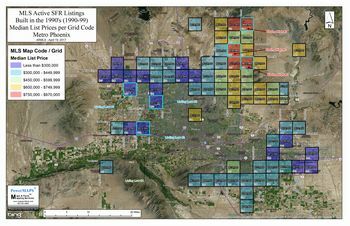 This month�s map color codes the 478 K-8 public schools as grouped by School District. Individual school test results (AzMERIT) should be released soon through Arizona Department of Education. The past month, two major events portend the future direction of Metro Phoenix�s growth. 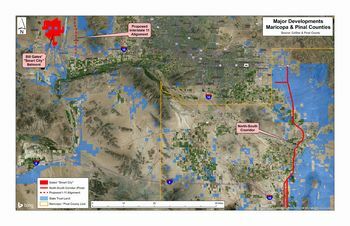 An entity involving Microsoft founder Bill Gates purchased 20,000 acres in far west Maricopa County north of I-10 and within a proposed Interstate 11 corridor connecting Las Vegas to Mexico. 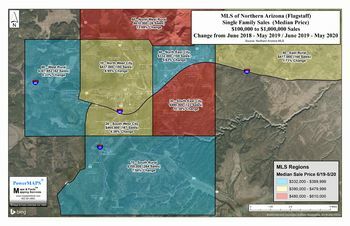 On November 7 Pinal County voters approved the planning and funding of major transportation improvements including a North-South Corridor connecting US 60 near Apache Junction with Interstate 10 in Eloy. While both projects are years from fruition, they give us a hint as to Metro Phoenix�s future growth paths. 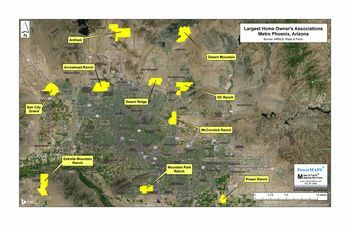 This month�s map depicts Metro Phoenix�s 10 largest residential subdivisions with HOA�s. HOA�s have private architectural, use, design, age and/or other guidelines typically detailed in documents called CC&R�s (Conditions, Covenants, and Restrictions). Unless contradictory, HOA regulations and CC&R�s are in addition to those imposed by the municipality in which the subdivision is located (i.e. : zoning). HOA regulations and CC&R�s are designed by the developer to enhance marketability, protect value, and provide additional buyer guarantees that the original character of the subdivision will be maintained and protected. Homeowner Association documents and CC&R�s can usually be accessed through the individual HOA website or property management company.